Election Duty Employees TA & DA GO in Telangana Assembly Elections 2018 : TS GO Rt No 2463 ,Dt 03.12.2018. General Elections to the Telangana Legislative Assembly, 2018 to be held on 07.12.2018 Financial Authorization Concession in TA and DA to the Chief Electoral Officer, the Observers, the DEO Payment of remuneration to the Polling Personnel Payment of sundry expenses to the Presiding Officers. 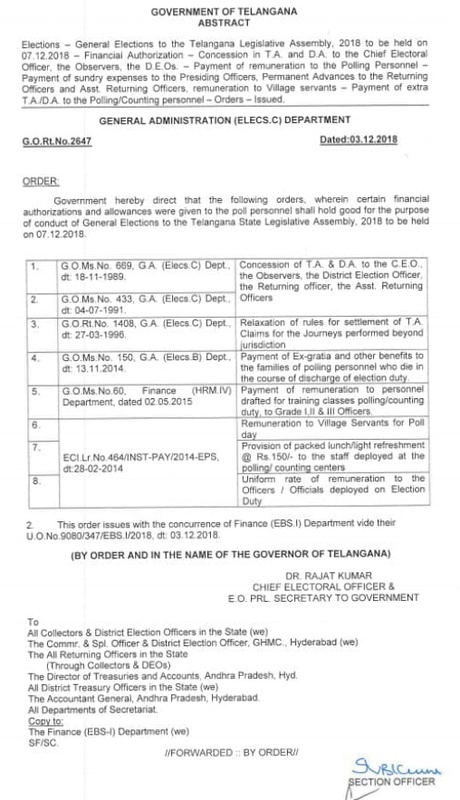 Permanent Advances to the Returning Officers and Asst Returning Officers remuneration to Village servants Payment of extra TA/DA to the Polling Counting personnel-Orders-issued. Election Duty Employees TA & DA GO in Telangana Assembly Elections 2018.